I started the Hispanic Nashville Notebook on October 21, 2003 - six years ago today. For the four years up to that point, I had been printing and keeping a physical notebook of Nashville's Hispanic stories, but online technology made me give that up. Keeping an electronic record was easier, and so this web site was born. From 2003 forward, whenever I wanted to share a story that I had seen about our Hispanic neighbors in Nashville, I knew where I could find it. And eventually, so did you. Looking back over those six years, we see not only news but also lives collected here - from the first child born in Nashville in 2004 to the 2009 passings of writer Tim Chavez, 5-year-old Max Gomez, and singer Azucena Rios. 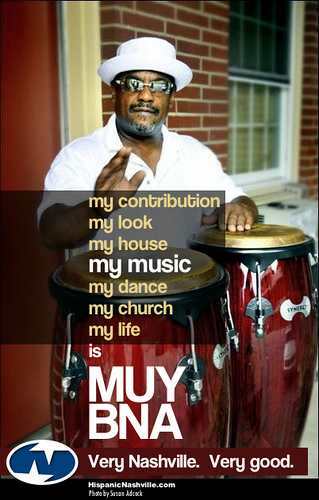 To my Hispanic neighbors in Nashville, including my own Hispanic family, you are muy bna. Since these are your stories, Happy Sixth Anniversary. To hear the story of Humberto, the man in the photo above, click here. Photo by Susan Adcock, copyright 2008. Used with permission. Congratulations for keeping us conected already 6 years! John, I read your blog every day, I believe you give everybody in the community a fair shot and I congratulate you for it. Keep up the good work! John, you've done a great favor for the Hispanic community here in N'ville, as well as a great job with this site. Congratulations and thanks for all your hard work.